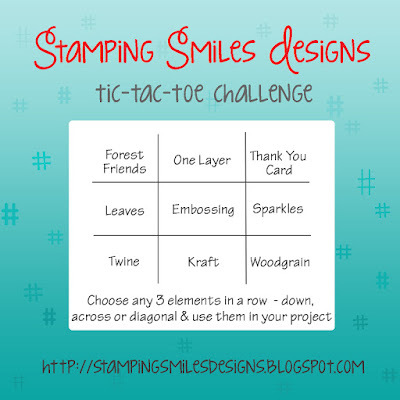 Hello everybody, Welcome back to Crafty Time 4U, Today i am sharing with you an easy project that I created to entered the Design team call for the Stamping Smiles Design "Tic-Tac-Toe Challenge" I read all about this challenge and I am so excited about it, I love the whole idea behind it and I the endless possibilities that I can created with. I cut the pillow boxes from some craft wood grain embossed card stock, (by Ellen Hutson) then I used the Lawncuts stitched leaves to cut some leaves from white card stock and gold foil paper, I color the leaves using Distress Inks and a blending tool. I also sponge the pillow boxes with a little "Tea Dye Distress Ink." to give them some more texture. I wrapped some "Gold Sparkle Lawn Trimmings" twine by Lawn Fawn and I cut a a little banner to stamp the sentiment. I used the "I'm so thankful" sentiment from the "Happy Feast" stamp set and I adhered the banner and the leaves on top the twine using permanent big glue dots. Very simple project for the Thanksgiving table or for a small Thanksgiving gift, I love all the possibilities this challenge brings you. I used the bottom three elements of the "tic-tac-toe board: twine, craft, and wood grain but I also incorporated some sparkle and leaves. You can enter this Design Team Call by clicking HERE There are only two more days to enter, so hurry, I am sure it will be fun! These pillow boxes are amazing! I love the fact that you used woodgrain textured cardstocks for the bases. I also love how you sponged the leaves and even added gold leaves! How fun!! These would be perfect for Thanksgiving favors to give to family and friends! I absolutely love them! Oh so PRETTY Heidi! Those are wonderful for the table.... The little ones can open them and find some yummy goodies just for them... or even better maybe some crayons and a small digi stamps for them to mess with.... Oh Great... now I've got ideas coming out the ears with these! LOL Have a wonderful day!